There’s not an entrepreneur in the world who likes tax time. Yes, it’s February, but its best to be prepared when it comes to April 15 or March 15 for Corporations (that’s right around the corner.) Now is the time to organize. Almost every aspect of your business has tax consequences, if you are not well informed, you are asking for an audit. 1. “I can do it myself.” Most small business owners do not have the tax knowledge they necessary to process returns and may run into flagrant errors that cost them more in the long run. Most often a business especiall start-ups think cheap, so they use TurboTax or worse an unreliable tax preparer. TurboTax won’t represent you or your business, some fly by night tax peparers will leave you high and dry as well (make sure to get a PTIN and have your preparer sign your return.) It is best that you hire an Accountant or Professional Tax Preparer that has business experience, ask for recommendations and always ask questions. An Accountant or Tax Preparer who is not willing to give you the time to answer your questions and explain your return, is not worth it. Maybe you really are capable of doing your own tax planning. Maybe you can stitch that open wound, but are you really going to be able to fight the ensuing infection that will develop. Some things are best left up to professionals and exemplary ones at that. 2. “Yay! 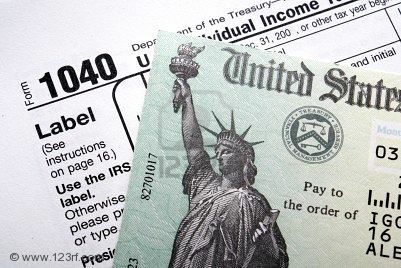 A big fat refund.“ Many people are thrilled when they get a big check from the IRS. Wrong! A refund means you’ve given the government interest-free money for a long time. If you are an employer you want to use your employee witholding, to gain interest, so that you are not just losing money. Taxation and inflation are the easiest and biggest way to lose money. Reduce your tax liability, not give away your money to the government. 3. “I’ll just borrow a little from employee withholding.“ When Businesses are short on cash, it’s often appealing for small business owners to dip into employee withholding and Social Security. It’s a common misconception of employers to think ‘ this is my money.’ This is just not the case. If a business borrows from withholding or Social Security, they are personally liable, with huge potential penalties. In situations like this it is best to be prepared and create multiple streams of income, so you are not tempted to dip into the forbidden cookie jar. 4. “Let’s make everyone an independent contractor.” Employees are costly . Independent contractors, not so much. So why not make everyone independent contractor? It’s not nearly that easy. When classifying a worker as indepedent contractor, they must be just that Independent. Typically, independent contractors can make their own hours and have control over where, when, and how work is completed. The key word being control, if you exert control over your worker then they are an Employee. If the IRS determines that you incorrectly designated an employee as independent, you may be subject to penalties for not collecting Social Security taxes, and for more than 40% of workers compensation for the specified time period. Also you may be in a world of pain with other governmental departments for that particular misclassification like the Department of Labour which can exact fees and fines for non-compliance. 5. “I can pay myself whatever I please.“ If you’re incorporated, that just is not the case. For example, say you typically pay yourself $100,000 a year. After a profitable year, you decide to increase that to $300,000. You need to substantiate a reason for the increase, or part of the money can be disallowed by the IRS as unreasonable compensation. Then those unreasonable funds can be taxed at the corporate level, and distributed as a dividend. And then you’ll pay tax on the dividend, so make reasonable choices when it comes to issues and sensitive as payment, also consult an Accountant who can help guide you in making the right decisions for you and your business. 6. “That can’t possibly be deductible.“ Not so fast! Dry cleaning suits worn at that business conference? If it was an overnight business trip, that dry cleaning bill is deductible. A movie and dinner with friends, with whom you also talked business? That is also deductible. Just make sure everything is documented, cross your t’s and dot your i’s, legitimate expenses can be scrutinized so always be prepared. Educate yourself on all the sublime deductions you may be missing out on. Also consult your Accountant or Tax preparer for up to date information regarding tax deductions and incentives throughout the year so you are making informed choices in your business. 7. “I can’t afford to hire my kids.“ Well, sure you can. Especially your kids who are in college. Pay them a reasonable wage for the work they perform (perhaps building a website or helping with simple operational costs,) and you’ll be able to deduct their wages as a business expense. Then, have them use the wages to pay for college. It not only teaches them responsibility and the value of money as well as the cost of their education, it also has a side bonus of making college tuition deductible. Also, remember that up to $5,800 in income is tax-free for your children. This entry was posted in Educacion Financiera, Education & Finance, Money Saving Tips, Small Business, Tax Tips and tagged 1099, Ahorro, Audit, Audit Advice, Avoid an Audit, Budgeting, Current Events, Economia, Economics, Economy, Educacion, Educacion Financiera, Education, Employee, Familia, Family, Finance, Financial Education, Financial Independence, Finanzas, Free Stuff, Impuestos, Independencia Financiera, Independent Contractor, Invertir, IRS, Money Saving, Money Saving for Small Business, New Tax Incentives, News, Noticia, Saving, Small Business, Tax, Tax Benefits, Tax credits, Tax Credits for Small Businesses, Tax Deductions, Tax Savings, Tax Tips, Taxes, Tips for Savings, Trabajo, Work. Bookmark the permalink.